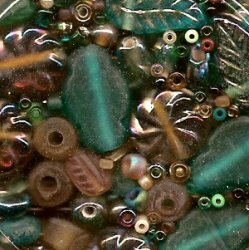 Colors = large and small pressed beads of a bi-color mix of warm green and amber in matte and rainbow finishes, dosed liberally with Pineapple Crunch Bead Gravy. Reminiscent of prolific garden veggies, this toasty summer warmth will brighten jewelry or stitched embellishment. 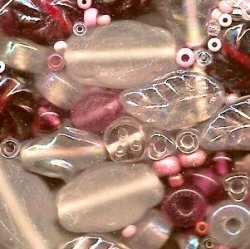 Colors = large and small pressed beads of crystal, frosted rainbow crystal, rose pink, rainbow ruby, touch of white and champagne, and the complement pink Bead Gravy. Think of it as a cooling parfait of vanilla whites and light strawberry pinks. 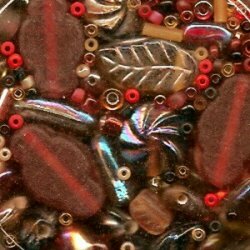 Colors = large and small pressed beads of a tri-color mix of red, amber, and a touch of smoky black in rainbow and matte finishes, stirred together with Red Currant Royale Bead Gravy. The colors of harvest, apple red and gold to dark plummy red edged in black, will find a place in a royal creation of heart to hand. 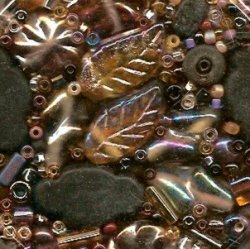 Colors = large and small pressed beads of a tri-color mix of amber, violet, and a touch of smoky black in rainbow and matte finishes, baked warmly with Caviar Blend Bead Gravy.  A truly elegant and popular color combination, this beady blend is a pleasure of visual taste. 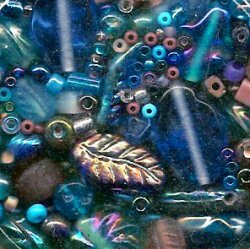 Colors = large and small pressed beads of a tri-color mix of aqua blue, cobalt blue, and violet in rainbow and matte finishes, mixed liberally with Plummery Blue Bead Gravy. Tough to name blue foods, but this mix looks like a dish of summer blueberries in all those soft shades of fresh picked. Enjoy!